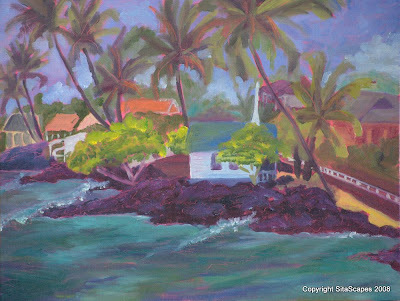 SitaScapes: "Wedding Chapel on the Shore"
"Wedding Chapel on the Shore"
Artists Comments: At arrival to Kahalu'u I was not particularly inspired by anything in particular. But after surveying the entire shoreline, I found a perch where I was able to capture the Church along the shoreline with speckling of colorful rooftops and homes along Ali'i Drive beyond. I chose a hot pink wash to in hopes these undertones would cheer up the overall mood of the painting. I simplified the homes which added a whimsical touch which I liked.